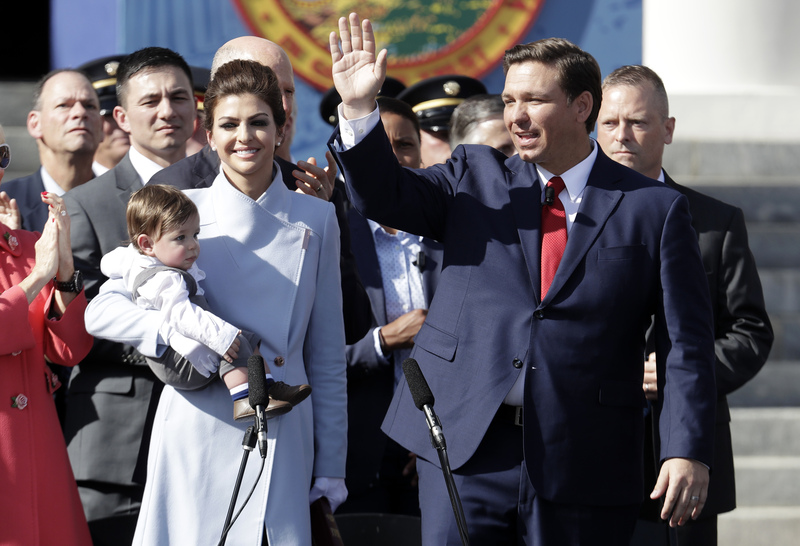 Florida’s new Republican governor made headlines his first week in office in January with an environmentally focused executive order that included funding for Everglades restoration and new state-level positions focused on scientific analysis and accountability. Gov. Ron DeSantis has earned cautious praise from environmental groups who say the commitment is a substantive step forward on water quality issues and underlying Everglades restoration challenges. But some state environmental leaders also say the order does not go far enough because it does not explicitly address the growing threat of climate change, which exacerbates some of Florida’s most severe environmental problems. The executive order creates a task force focused on preventing blue-green algae blooms in waterways and on shorelines. It continues a grant program to help local governments contend with the lingering effects of a red tide algal bloom last summer that left beaches strewn with dead fish and turtles. Gov. Ron DeSantis has earned cautious praise from environmental groups who say the commitment is a substantive step forward on water quality issues and underlying Everglades restoration challenges. But many environmental leaders say that to address Florida’s environmental problems, Mr. DeSantis and other state leaders also need to take direct action on climate change because the changing climate is intensifying existing challenges. Heat, humidity and warming oceans encourage the growth of algal blooms. Rising seas drive saltwater into the freshwater Everglades, imperiling restoration progress. And scientists and urban planners say as warming temperatures continue to melt ice sheets and drive up sea levels, sea walls and other efforts to protect coastal communities will need to be reinforced. Thus far, Mr. DeSantis has not publicly acknowledged climate change or said that man-made greenhouse gas emissions are responsible for global warming. That omission draws polite skepticism from the small but growing coalition of Florida Republicans who are pushing for action. Right now there is no way to reverse warming trends or re-freeze melting ice sheets. Technologies to remove the greenhouse gases that trap heat in the atmosphere are extremely expensive, and planting billions of CO2-scrubbing trees might require available land the size of Canada. But even if the world cannot currently reverse climate change, there would be significant gains from curtailing it. In a report late last year, the United Nations Intergovernmental Panel on Climate Change said limiting future warming to half a degree Celsius (0.9 degrees Fahrenheit) would likely protect 61 million people from water shortages, safeguard about 23 percent of the global population from severe heat waves, and keep the world’s coral reefs from almost completely disappearing. Those types of significant gains are one reason eight Florida children and teenagers recently added Mr. DeSantis to a lawsuit over climate change impacts. The plaintiffs claim Florida is jeopardizing their constitutional rights to life, liberty, property and the pursuit of happiness by relying on energy sources that exacerbate climate change. They are asking the state to cut greenhouse gas emissions and do what it can to lower atmospheric carbon dioxide levels. “The time has come for adults to set the politics aside and take our concerns and the science seriously before it’s too late,” 19-year-old Delaney Reynolds, a plaintiff, said in an emailed statement. The Florida Conference of Catholic Bishops expressed support for DeSantis’ executive order and encouraged lawmakers to continue the momentum on addressing state environmental concerns. “An ongoing commitment to the protection of Florida’s natural resources is needed to ensure the health and well-being of generations to come,” Marco Paredes, the conference’s associate director for health, said in an emailed statement. An abundance of evidence suggests action on climate change is critical to ensuring the future health and well-being of Floridians. An abundance of evidence suggests action on climate change is critical to ensuring the future health and well-being of Floridians. Many parts of Florida are experiencing more days with temperatures in the 90s, leading to increased health risks for elderly residents, people with heart and lung conditions, and outdoor workers. Southeast Florida could see widespread contamination from septic tanks and could face rising insurance rates because of increased flooding and stronger hurricanes. In some areas of Miami, low-income residents are feeling pressure to sell their homes to developers seeking property on high ground away from the water. Statewide, a study last year found that more than 1 million Florida homes could experience chronic flooding related to sea-level rise by the end of the century. The impacts Florida and the world are beginning to experience from climate change constitute “an unsustainable environmental debt” that is “as reckless and as irresponsible and selfish as leaving an unsustainable fiscal debt,” said Mr. Curbelo. He said the growing awareness of environmental issues among Florida Republicans bodes well for action on climate change—even if party leaders are not yet comfortable using the phrase. “I’m hopeful that young Republicans and Florida Republicans are going to be driving the evolution in the party,” he said. U.S. Rep. Francis Rooney, whose district includes Naples and Fort Myers, is a Florida Republican who has recently risen to national prominence by pushing for bipartisan action to cut greenhouse gas emissions. On Jan. 24, Rooney was introduced as a co-sponsor of a new national carbon pricing plan alongside two of Florida’s Democrats—former Gov. Charlie Crist and U.S. Rep. Ted Deutch, who co-founded the Climate Solutions Caucus. In a statement, U.S. bishops welcomed the plan and encouraged further bipartisan climate action. “Climate change is beginning to be seen as a crucial moral issue; one that concerns all people,” said Bishop Frank J. Dewane, Chairman of the U.S. Bishops’ Committee on Domestic Justice and Human Development. I'm a pro-life moderate Republican. I still believe in many positions espoused by the Democratic party, of which I was a member for almost 30 of my 56 years. I support the Catholic Climate Covenant, a pro-life environmental group. I'm glad that Gov. DeSantis is making efforts to protect Florida's environment. I think Congressman Chris Smith of New Jersey has much in common with DeSantis. The Governor is pro-life on abortion. Smith, a moderate Republican, is the co-chair of the Congressional Pro-Life Caucus. He was ranked by the Lugar Center as the 17th most bipartisan member of the House during the 114th Congress. I believe it's important for our elected officials to cooperate with members of the opposing party. As of 2017, Smith received a lifetime score of 62% by the League of Conservation Voters. According to the Wikipedia website, Smith, who has served in Congress since 1981, believes in climate change and has called it " a global challenge that must be addressed with a global solution. " This article also appeared in print, under the headline "How Florida's DeSantis is putting the environment on his agenda," in the March 4, 2019 issue. Kate Stein is a writer and multimedia journalist based in Miami.